(PhysOrg.com) -- In a new study published in the journal Animal Cognition, Dr. Dalila Bovet from Paris West University Nanterre La Defense showed how African grey parrots are capable of cooperating and performing tasks as a team, but let their personalities lead their decision. The problem-solving test they used for their research was originally designed to test the team work ability for chimpanzees and has also been used with elephants. A tray was filled with food for the birds, but in order to acquire it, they needed to work as a team to pull it toward them by two strings. They demonstrated the ability to understand that they needed a partner in order to complete the task and they would wait for them to arrive. In another task, one of the birds was required to climb a perch in order to release the tray which was then pulled by the second bird, and they were also able to carry out these complementary roles. However, in the third test, the parrots let their personalities shine through. When the birds were given a choice of performing an individual task with less food reward versus a team task with a reward of twice as much food, the results were dependent on which of the three birds were participating. Shango proved to be the more individualistic bird and was more prone to choose the solo task. 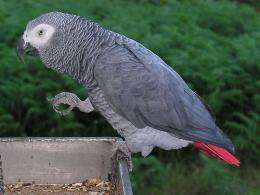 Zoe, the one female, would only choose the team task when paired with Leo, a male parrot she was reared with, but she refused to work as a team with Shango. Leo seemed to like his extra rewards and always choose to take a partner. This shows the researchers that the birds were not just demonstrating a conditioned response to completing the task, but used their personalities in their decision of whether to work as a team or go it alone. One of the main characteristics of human societies is the extensive degree of cooperation among individuals. Cooperation is an elaborate phenomenon, also found in non-human primates during laboratory studies and field observations of animal hunting behaviour, among other things. Some authors suggest that the pressures assumed to have favoured the emergence of social intelligence in primates are similar to those that may have permitted the emergence of complex cognitive abilities in some bird species such as corvids and psittacids. In the wild, parrots show cooperative behaviours such as bi-parental care and mobbing. In this study, we tested cooperative problem solving in African grey parrots (Psittacus erithacus). Our birds were tested using several experimental setups to explore the different levels of behavioural organisation between participants, differing in temporal and spatial complexity. In our experiments, African grey parrots were able to act simultaneously but mostly failed during the delay task, maybe because of a lack of inhibitory motor response. Confronted with the possibility to adapt their behaviour to the presence or absence of a partner, they showed that they were able to coordinate their actions. They also collaborated, acting complementarily in order to solve tasks, but they were not able to place themselves in the partners role.